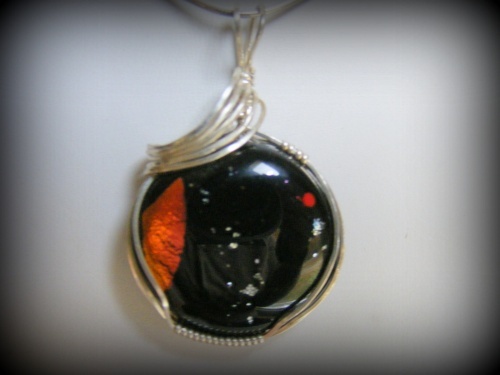 This beautiful handmade dichroic fused glass pendant resembles the night sky with tiny silver stars and an amber like sliver of the moon against the dark black sky make it so pretty and different from any other piece. Sculpted in a sterling silver frame with a slight silver swoop across the top of the piece. Measures 1 7/8" from top of bail to bottom of pendant and 1" across. Comes with a sterling silver snake chain.